1 First we want to make some purple grapes, so start off with some blue and red. 2 Start by twisting the colours together like we did with the blue and yellow to make the colour green. 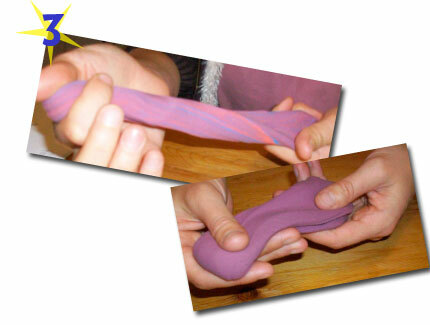 3 Keep warming it up in your hands and you should end up with some purple air dough, it’s like magic!! 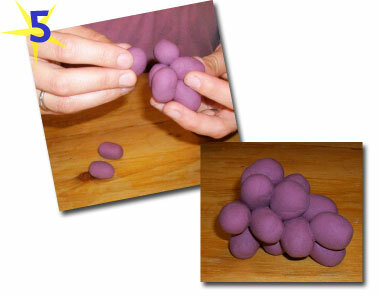 4 Roll some ‘grape size’ balls, not completely round. 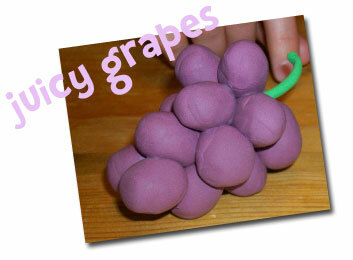 Make about a dozen or so to make a decent size bunch of grapes. 5 Start grouping them together, pressing them so that they stick to each other. And they should look something like the image below. 6 Now get some of the green from the Tomato section, if you havent made this simply follow the instructions on how to make the colour green. 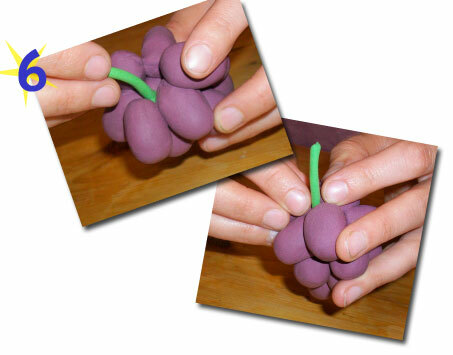 Place it at the top and put in between the grapes like so. Lets make a juicy apple next!! 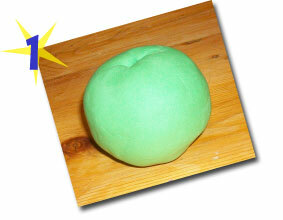 1 Make some green, by simple mixing blue and yellow together, enough to make an apple sized shape. 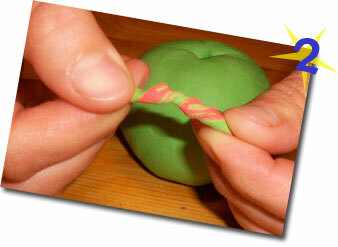 2To make brown for the stem, u simply mix some red and green together twisting and rolling in your hands and it will mix. 3 Make a little hole at the top of the apple, and role the brown into a little stem like shape and push gently onto the hole. 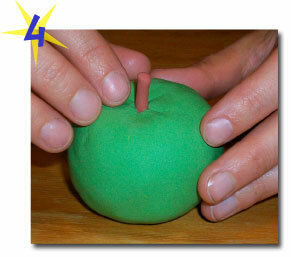 4 push the green around the stem and there we have it, a very green apple!! 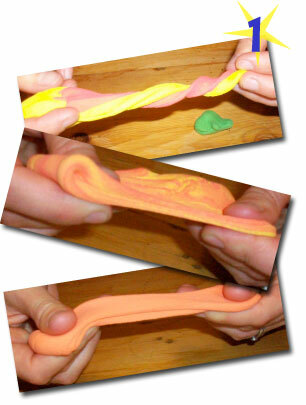 1 First get some yellow and red airdough, twisting and warming up to get a good orange colour as shown above. 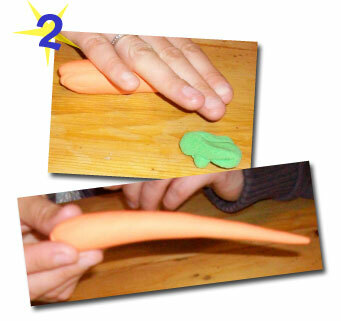 2 Roll the orange piece into a carrot like shape, you could always get a real carrot for reference. 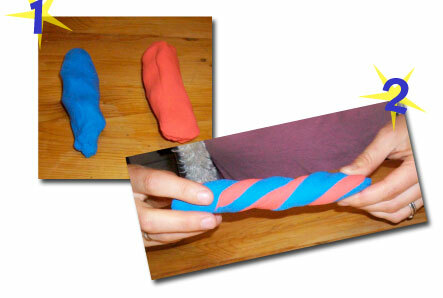 3 Get some green (yellow and blue mixed together) and roll a long thin piece. 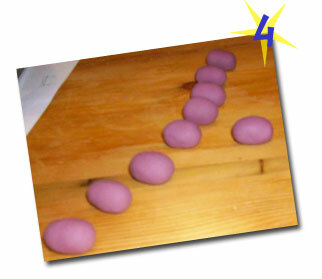 4Then get your safety knife out and cut roughly inch long sections, and about half a dozen of them. 5 Now bunch all of your green bits together like shown. 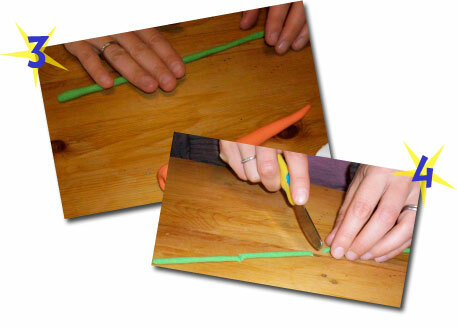 Make a hole in the top of your carrot and press the green bunch on to it sticks. 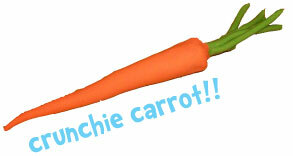 And there we have it, a ‘not so crunchie’ carrot.